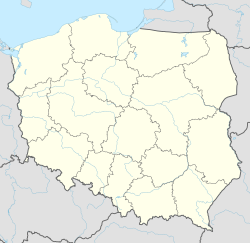 Barlinek [barˈlʲinɛk] (German: Berlinchen) is a small town in Myślibórz County, in West Pomeranian Voivodeship, in northwestern Poland. It is the administrative seat of Gmina Barlinek. Barlinek is located in the historic Neumark region on the Płonia River, about 30 km (19 mi) north of Gorzów Wielkopolski. The town has 14,162 inhabitants (as of 2009[update]). The settlement of Nova Berlyn was first mentioned in a 1278 deed, when it was founded by the Ascanian margraves of Brandenburg. It was meant as a stronghold in the newly acquired Neumark region, bordering on the Pomeranian estates around nearby Pełczyce, which the margraves nevertheless conquered soon afterwards. In the 14th century, the town gained its first fortified walls (still partly visible) and in the first half of the 15th century, the town was under control of the Teutonic Knights. Before and after, the Neumark was part of Brandenburg, which from 1701 on belonged to the Kingdom of Prussia. From the 18th century onwards the town prospered as a centre of brewing and cloth manufacturing. After World War II, the town with the eastern part of Brandenburg was annexed by the Republic of Poland and renamed Barlinek. The remaining German population was expelled. Berthold Lasker (1860-1928) a German physician, writer and chess master. Marcin Matkowski (born 1981) a Polish professional tennis player whose speciality is in doubles. Wikimedia Commons has media related to Barlinek.